The Legend of the True Cross, 3. 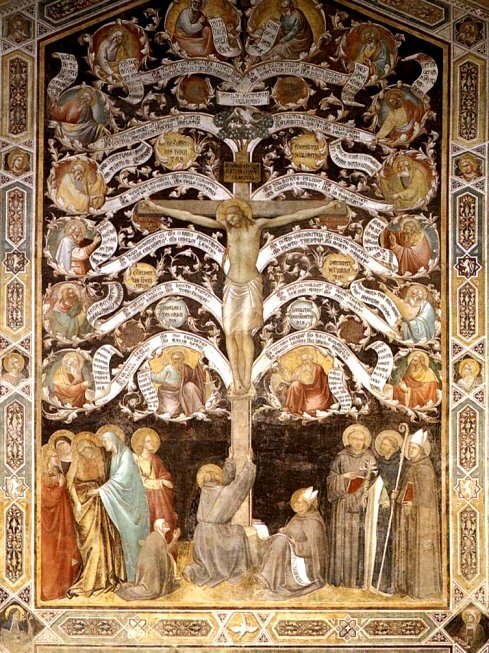 The Franciscans and the Tree of Life. It would be a great mistake to think of the Franciscans of Arezzo and Florence as naive believers in fairy tales. Both sequences I've looked at are representations of quite complex Franciscan theology. One way to get to grips with this is the leave Santa Croce through the side door and visit the refectory, now a museum containing some magnificent art. Perhaps the most poignant item is the badly damaged crucifix by Cimabue, a victim of the floods in Florence in 1966. On a wall of the refectory is this fresco by Taddeo Gaddi, Agnolo's father. Very few visitors have a clue what it represents; I certainly didn't when I was there. My recent research on this topic has helped a little! The lower section is the most familiar - the Last Supper. The four panels that surround the main image take a little more sorting out. Top left and bottom right are familiar too; St Francis receives the stigmata, and Mary Magdalene washes the feet of Christ. As with the Magdalene image, the other panels match the Last Supper theme by depicting events at meals, but rather obscure ones; 'The Priest at his Easter Meal Receiving Word of St Benedict's Hunger in the Wilderness' (top right) and 'St Louis of Toulouse Feeding the Poor and Sick of Toulouse'. It's the centre panel we are interested in, and here it is. Gaddi's fresco is becoming a little clearer. Each branch has the opening text of one of the twelve sections of Bonaventure's book; various prophets holding scrolls of prophecies take the place of fruit. A crucifix is superimposed on the tree. At the base, St Francis embraces the cross, while next to him St. Bonaventure is busy writing. How does St Francis fit into this? For Bonaventure, the stigmatic Francis is a new Christ. The final scene of the cycle shows the return of the Cross to Jerusalem, celebrated as the Feast of the Exaltation of the Holy Cross, an important feast day held on September 14th. September 14th is also, traditionally, the date on which Francis received the stigmata. 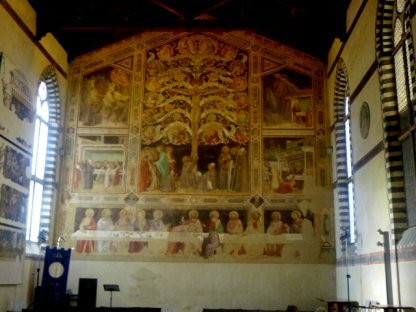 If you read commentaries on the Piero and Agnolo frescos you will notice that some suggest that the tree involved in the story is the tree that grew that all-too-tempting apple, the Tree of Knowledge. They are quite wrong. As I've tried to show here, the Tree of Life is central to Franciscan theology, and, of course, both churches were Franciscan. My thoughts, after working on this theme? I'm entirely unqualified to comment on the theology, but as a writer, I am in awe at the understanding and exercise of the power of allegory and image demonstrated by Piero della Francesca, the Gaddis, those Franciscans, and above all St Bonaventure. I'm writing this in the middle of December, and now every home is setting up its Christmas tree. Pagan symbol or not, I'm sure Bonaventure would be delighted.